If you are reading this article, you probably already know why sending press releases is good for your business. They draw public attention, boost brand recognition, improve company image. That is, if they ever make it to the audience. Editors are busy people, so they will highly appreciate it if you get straight to the point. Communicate the main idea at the beginning of your release, and then provide relevant facts and details in order of decreasing importance. 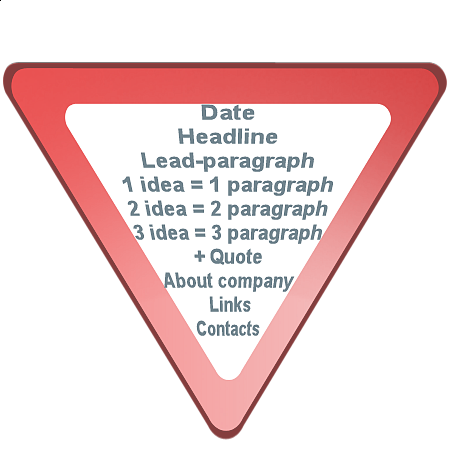 Be sure to include headline, information about your company, links and contact details. Don't forget the release date - let editorial staff know the information is current. The headline should clearly state the key point of the release in no more than 80 characters. The famous 80/20 rule applies to press releases too: out of 10 people only 2 will read beyond the headline. Editors receive dozens of press releases every day, which means that you have to make yours sound newsworthy from the very title. Try to be informative without being boring - state the message of your press release in a way that will make the editor want to read further. The opening paragraph of your press release should answer five essential questions - who, what, where, when and why - in 2 or 3 sentences. If the editor decides to publish your press release as is, he will often take only the first paragraph or two, so it is in your best interest to put the most important information in the beginning. Long paragraphs can be difficult to read, and they are more likely to bore the reader. Save long elaborate paragraphs for novels; stick with shorter ones when dealing with a press release. Present one idea per paragraph and link paragraphs with logical bridges. By quoting someone who has already tried the product or service featured in the press release you will make the text more credible (bonus points if that person is a celebrity or a known expert). The same goes for a quote from the company spokesperson. Include the paragraph describing you business (a boilerplate). The boilerplate usually contains the year of foundation, list of the services offered, market experience, and company motto, but you are free to add the details that make you stand out from the competition. The sad truth is that people tend to care far more about themselves than about something else. Editors know that and write with their readers in mind. If your press release tells people what your news will mean to them, its chances to get media attention automatically increase. A press release is not a sales copy. Nobody is interested in giving you free ad space. If you really want free publicity, make sure the text reads as if written by an independent reviewer. Use third person format, focus on facts rather than emotions, be specific and avoid hype. "One of the best products" sounds more believable than "the best product"; if you still think you have the right to use the latter variant you will have to prove it by facts, numbers and comparisons. Mistakes make you seem unprofessional, so it is vital to get rid of all the errors before distributing your press release. Do it yourself or have a fresh pair of eyes look at the text before you finalize.